We might be months from hearing sleigh bells ring, but with the first brew of this year’s Anchor Christmas Ale already in the books, we’re in the mood to celebrate. 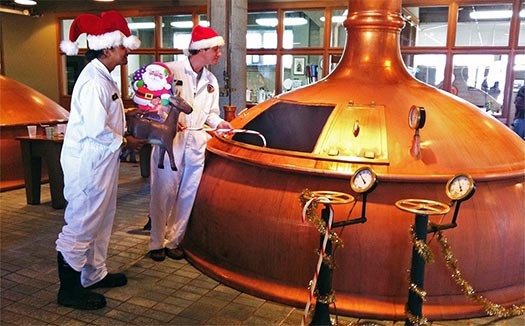 We’re celebrating “Christmas in July” at the brewery all month long with a special Christmas in July Bucket, filled with bottles of Anchor Christmas Ales past and other goodies made for summer fun. 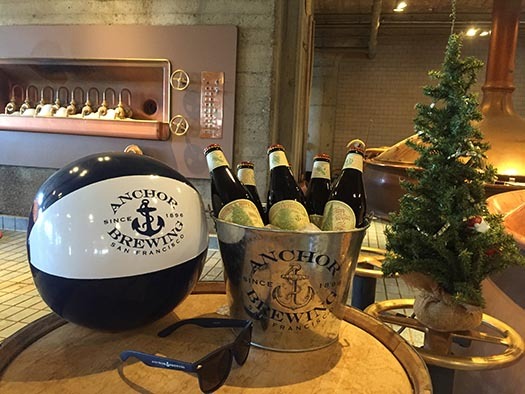 Available for $25 only at the Anchor Brewery in San Francisco, each Christmas in July Bucket includes a Christmas Ale Vertical 6-pack with two bottles each of 2013, 2014, and 2015 Anchor Christmas Ale, an Anchor Brewing Beer Bucket, a pair of Anchor Brewing sunglasses, and an Anchor Brewing beach ball. These festive collections will be sold through the month of July while supplies last. But wait, there’s more! We also have a limited number of 2015 Christmas Ale Magnums available for purchase at $15.99 each, while supplies last. On Friday, July 29, we’re closing out a month of Christmas in July with a special Firkin Friday at the Anchor Beer Garden at the Yard. We’ll be pouring a special Anchor Christmas Ale, cask-aged with a little something extra, from 5:30 until the cask runs dry, so come early! Anchor brewers will be on hand to tap the firkin and chat about the beer. Of course, the ingredients are a secret, as they are with each year’s unique recipe, but the 40+-year tradition of a robust, flavorful ale for celebrating the season remains the same. While you’re there, check out our “Black Friday” merchandise sale. $5 off all items!